Concept for Cloud Nation by Claire Healy and Sean Cordeiro. Artwork Impression (not to scale) by Konrad Hartmann and Event Engineering courtesy of the artists and Roslyn Oxley9 Gallery. Base Image by Luxigon courtesy of Stewart Hollenstein and Stewart Architecture. Cloud Nation by Australian artists Claire Healy and Sean Cordeiro is a repurposed vintage ‘Beechcraft Travel Air’ plane that will be suspended inside the library. The surface of the plane will be transformed into a meticulously crafted miniature world. Small-scale dioramic elements will reference themes of migration and fantasy, recalling the fictional Island of Laputa from Jonathan Swift’s Gulliver’s Travels – Laputa is a flying island inhabited by people with a love of learning and culture. You’ll be able to view the artwork from different vantage points, including through binoculars from outside the library itself. 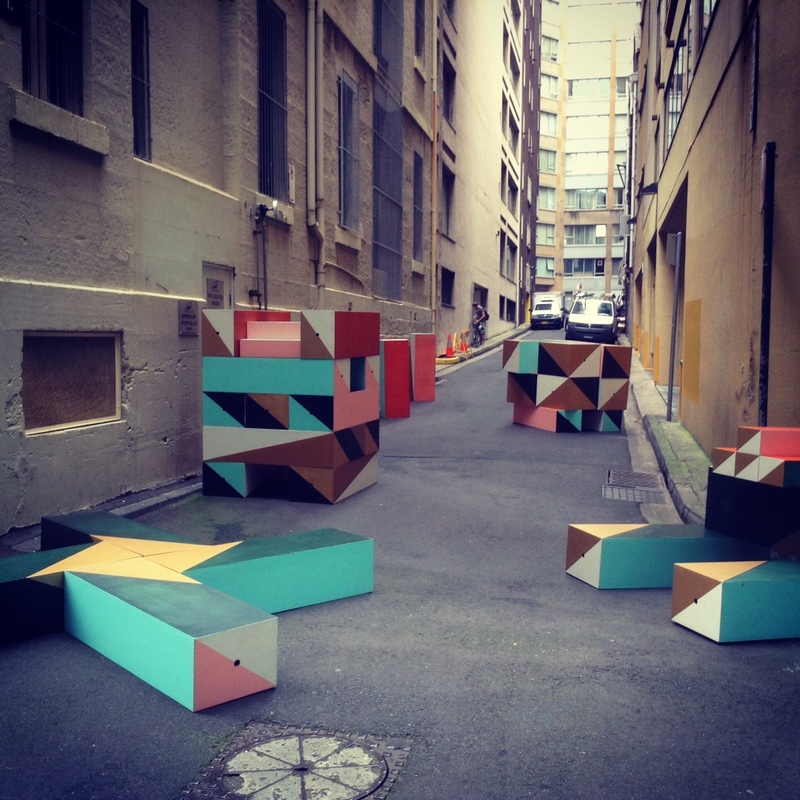 Building Blocks is an urban experiment and a mobile public art sculpture, animating streetscapes around Circular Quay, the gateway to Sydney, and a vital part of the CBD. While Circular Quay is home to thousands of workers, and plays host to many visitors and tourists every day, street life is less than active - there are few places for people to linger, to connect, to enjoy the city and claim the streets as their own. Building Blocks was designed to soften the edges of a part of Sydney that has the potential to be a warmer, more inclusive, more exciting place. Building Blocks appeared daily from April 7 to 11, 2014. The sculpture was reconfigured in a new location in the precinct each day between 7am – 2pm, inviting workers, residents and visitors to stop, take a seat, play a game and start a conversation. I collaborated with a fantastic creative team to deliver it: street artists, Jumbo and Bennett, colour masters Lymesmith, and architecture firm Fearns Studio. It's the first in a series of public art projects I plan to deliver around Circular Quay over the course of 2014, as part of a series of commissions by AMP Capital, building a conversation about how we imagine and use public space in this city. Building Blocks offers a suggestion of what Circular Quay street life could feel like given a renewed focus on a generous, active, social public realm. It will become a place where people want to linger on the streets, meet friends and catch the sun, enjoy music, play games, eat lunch or work outdoors. In June 2013 I was lucky enough to be selected to be a “provocateur” (how’s that for a job title?) in the Situate: Art in Festivals Lab, hosted by the Salamanca Arts Centre in Hobart. 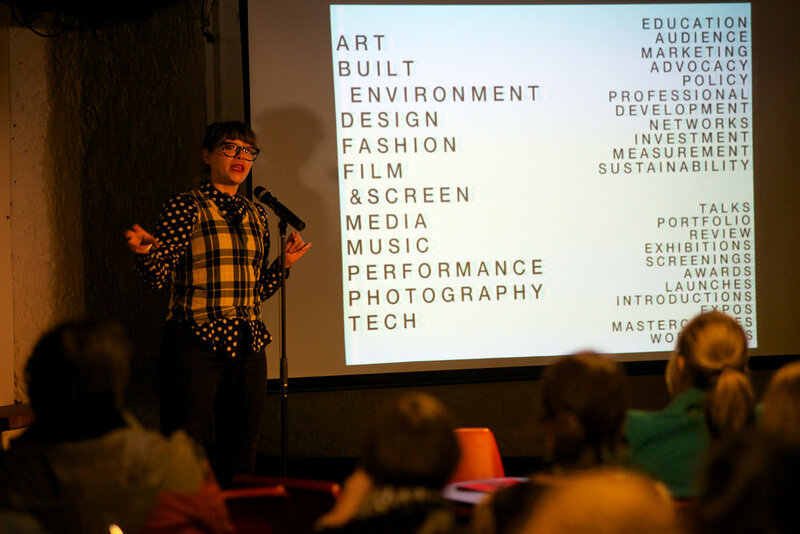 Situate is a unique development program that connects visual artists with festivals across Australia – and even one event in South Africa – supporting the development of a site-specific work to engage festival audiences, facilitated by 10 leading national and international artists and curators (provocateurs). As a provocateur I provided feedback to artists and challenged their thinking around audience participation and engagement. Festivals are moments away from every day life, when people are open to new ideas and experiences. You don’t have to go as far as constructing a city on a desert playa for that escape: most often, festivals come to us in the cities where we work and live, offering a new slant on the streets we know. Festivals can also be places of extreme sensory overload, entertainment and stimulation, confusion and anticipation. It’s a tricky set of circumstances for an artist to work within – can you whisper, or do you have to shout to be heard above the din? Can you expect reflection or demand attention from an over-stimulated audience? Will the audience tune out if you tackle difficult issues or require an emotional connection? While we experimented inside the sandstone walls of the Arts Centre, outside, Dark Mofo (MONA’s incredible winter spectacle of a festival) experimented with the form of a mid-Winter festival, offering a spectacular Bacchanal complete with dancing lasers, fire-throwing barbarian rockers, mind-bending smoke-filled chambers and Ryoji Ikeda’s luminous, reverential stairway to heaven, daring to part the skies every night. This eccentric, adventurous backdrop was the perfect incubator for this process: a place where anything was possible, and where audiences asked to be surprised, to see their city transformed, and new myths and legends formed. The Situate team asked me to reflect on the experience in a blog post – you can read the whole thing on their website, and meet the artists and provocateurs participating in the program.